But Mom, there is a speck in my water!! At times within my house Shih Tzu behavior can become very demanding. I think for those of you that live in a multiple dog household you can understand how crazy life can be when your furkids. Well I don’t know about you, but I was placed on this earth not to serve my husband, but to serve my dogs!! The thing I love most about my dogs are their personalities. Because of this I am still amazed at the metalities of some pet owners when I hear, ‘ He’s nothing like our last Shih Tzu.” Well of course not, this is a totally different dog. Are your children the same? It is because of these crazy personalities that I find so much humor in my day to day life. Over my lifetime I have had German Shepherds, Boxers, Pitbulls, Golden Retrievers, mostly big dogs with an exception of my moms shih tzu growing up. Now as an adult I have a majority of Shih Tzus and you can totally tell they are descendents of royalty, especially Katie. Katie is the Diva of the house. She will only allow you to hold her on her terms, and will snuggle when she wants. I guess you could accuse her of being a little snobby. But she is also sooo demanding. Water has to be clean, clean, clean!! Crazy as it may sound, but I change the water in the bowl at least 3 to 4 times a day. Katie is very demanding when it comes to her water and she will growl and bark at the bowl if there is a speck of anything in it! I have even tried putting a special filter in it to keep it clean but that isn’t good enough for her! It’s time to play with ME!! Believe it or not Katie will demand I play with her. And believe me there are times during the day when I try to get her to play, but nope, she’ll just walk away from me. It always has to be when she wants, normally between 8:30 – 10:00 pm! I want more food, feed me more, NOW!! Katie is a very slim 14 pounds, but can eat me out of house and home! Don’t worry, I have had the vet run blood tests etc. to make sure she is okay because she likes to eat a lot and she came out with a clean bill of health. She is just one of those girls with a very fast metabolism! 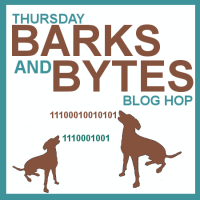 Today we are joining the Thursday Barks and Bytes Blog Hop hosted by 2Brown Dogs and Heart Like a Dog. We got lucky with Arty. Although he can be VERY stubborn, he is pretty easy going! You are so right about personalities…We have four in our pack and each are their own dog!! It’s amazing how stubborn they can be… yet they are so loving and wonderful at the same time… I guess they are true royalty!! Sounds a lot like a cat! 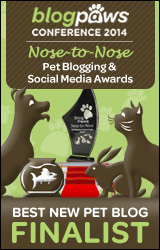 Rachel Sheppard recently posted…Win a Years Supply of FOOD for your Favorite Shelter!! At one of our off-leash dog encounters as I was explaining my dog could sometimes be ‘snarky’ the woman asked, “Isn’t that a lab?” Like labs can’t be snarky. Sometimes I’m just left shaking my head. Katie would never cut it at my house, Delilah is a messy dog and so many times I find things in the water bowl. Poor Katie would lose her mind. I think that is one of the advantages of having multiple dogs is you do get used to having different personalities. Friends of ours who lost a dog had a hard time adjusting to their new dog, same breed and some how felt it was the dog. No the dog is the dog, but it isn’t a clone of the old one. It has its own personality and you have to respect that. Our dogs have certain breed traits that are unmistakably Sheltie. However, each is like a human child, very individual and you don’t forget which one has which preferences. Thanks so much for joining the hop! It is funny how different dogs have different “personalities”. However, Katie sounds very much like our kitty Nestle. I am not kidding. lol She does all the things that you listed. lol!! that is so funny…because our Ninja kitty is very dog like in so many ways too!! or at least she does have her own demands. At least those are usually directed towards my husband!